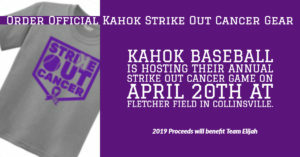 Kahok Baseball is hosting their annual Strike Out Cancer game on April 20, 2019 at Fletcher Field. Funds raised from this event are donated to a member of the Kahok Family affected by cancer. This year all proceeds will benefit Team Elijah. Elijah Lobb is the grandson Collinsville High School PE teacher Kim Lobb. In September, Elijah was diagnosed with rhabdomyosarcoma – a childhood cancer that forms in the skeletal muscle tissue. Elijah and his family have gone to St. Jude Children’s Research Hospital in Memphis for treatment and will be there for a minimum of 60 weeks. The treatment he receives at St. Jude is free, but his family still faces costs for both medical and living expenses. You can support Kahok Baseball and Team Eliljah by purchasing 2019 Strike Out Cancer t-shirts. Use this link to visit the official online store. Orders are being accepted through midnight this Wednesday, April 10.